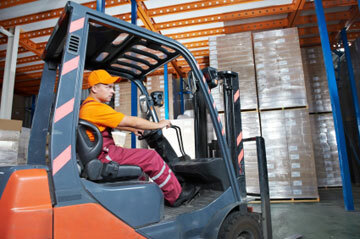 Any of these conditions can put both operators and fellow workers at risk of injury or death. Consider the danger of an unstable load as an industrial truck passes by a work zone and encounters a dip in the pavement. Suddenly that load has become a huge boulder tumbling across the work zone, crushing anything in its path. Or, how about those blind spots at intersections? Without correct training (or an AisleCop warehouse safety gate system) and procedures for dealing with these conditions, all workers are endangered as they travel in the same traffic paths with powered industrial trucks. How can you know for sure that corner is safe to go around? Additionally, poor maintenance practices put all workers at risk. When routine maintenance is not conducted, the equipment may have increased carbon monoxide exhaust, a loss of brakes or a hydraulic line rupture, making the vehicle more dangerous to operate. When braking ability or steering control is lost, this powered beast has become a wild, untamed animal driving workers in all directions to escape the dangers released. That’s why it’s so important to know and understand the nature of the beast. Powered industrial trucks, when tame and docile, can perform tremendous feats that allow us to enjoy great comfort and ease in our lives. But when we forget about the hazards of unsafe operation, we put ourselves and co-workers in peril. Never use powered industrial trucks to lift people up so they can reach something up high. Don’t allow riding on the lift forks, no matter how innocent the reason and short the trip will be, and avoid driving these pieces of equipment with an obstructed view. If you can’t see well in the direction you’re heading, it might be better to trail the load behind you. Remember, hazard is in the very nature of the beast. From the way it operates to the functions it performs and the workers around it - keep yourself safe, and keep that beast tame.